This post is way overdue. I made these for my friend Yeena's baby shower a few month ago. Needless to say, Yeena had her baby three weeks ago. lol. 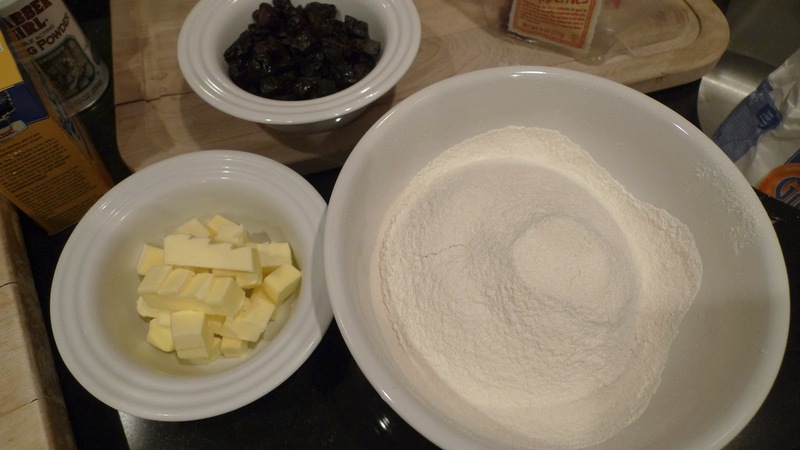 But fear not, in case you are in the mood to make some scones, here is a great recipe. I recently also saw a recipe in the NY Times for the classic scone. One of these days I shall try it for myself. I've been ambivalent about prunes, I'm neither offended nor enticed, but ever since my foray into Chicken Marbella, I've been intrigued by our wrinkly friends. 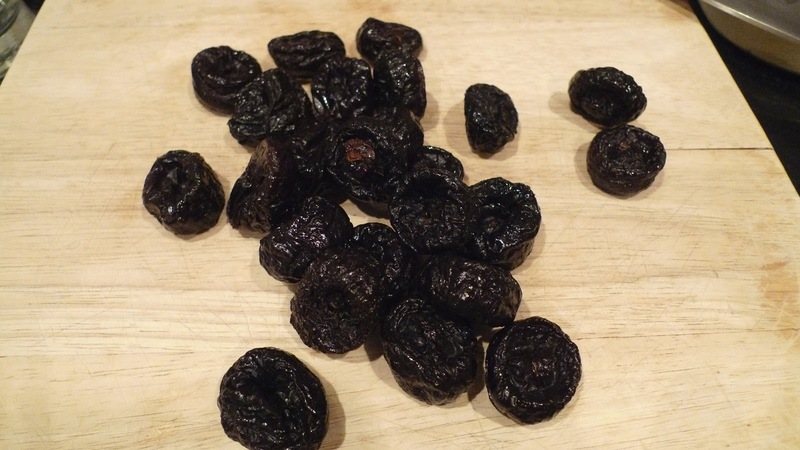 I've been saving this recipe for some time, but was weary about bringing a dish that has the word prune in it to a baby shower. I had fears that everyone's dish would be devoured except for my plate of scones. I even decided to rename it, vanilla and "dried plum" scones, hoping it would do the trick. Lucky for me, it worked and my scones got some love. If you are for some reason diametrically opposed to prunes, you can replace them with any dried fruit. Preheat oven to 350 degrees. Cut butter into very small cubes. Put back in refrigerator until you prepare all the ingredients and are ready to use them. Cut each prune into four pieces or smaller, if you'd like. Since I was making mini scones, I wanted smaller chunks of fruit. Sift flour, sugar, baking powder and baking soda into a large bowl. 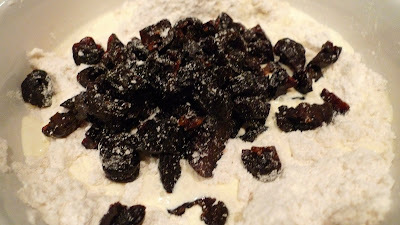 Add salt, prunes, seeds scraped from the vanilla bean, and vanilla extract. Mix well. Add butter chunks and work the butter into the flour mixture with your hands or an electric mixer. Work quickly at this point so as not to melt the butter with the heat of your hands. 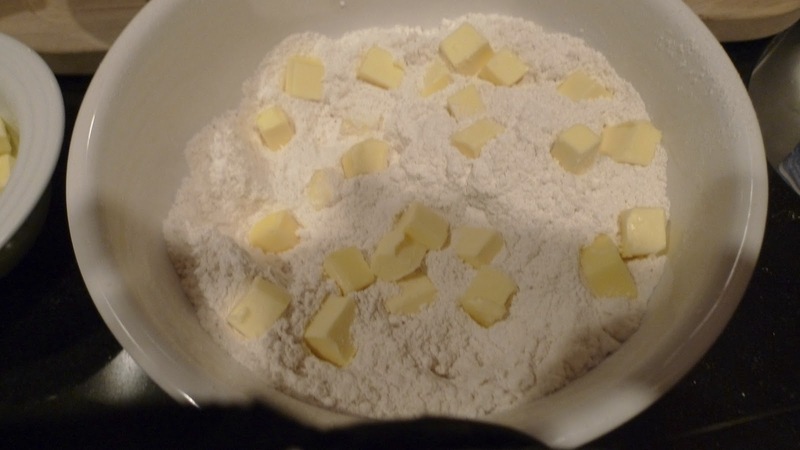 Mix enough so that the butter is the size of peas mixed into the flour. 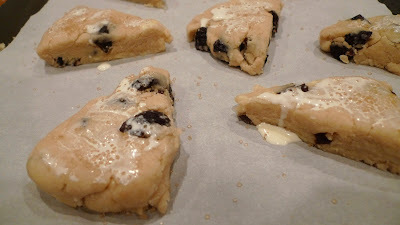 Set aside 2 tablespoons of the cream to finish the scones, and use the rest of the cream to work into the dough a little at a time. When all of the cream is added, the dough may seem very dry. If so, continue to work the dough with your hands until it seems more moist. It will eventually be incorporated enough and appear moister and cohesive. 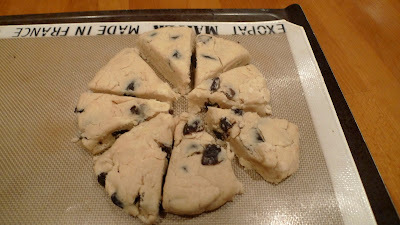 Note that scones are a drier pastry than most, so the dough will be drier than you might expect. Do not add extra liquid. Put the dough ball on a floured surface and roll with a floured rolling pin. 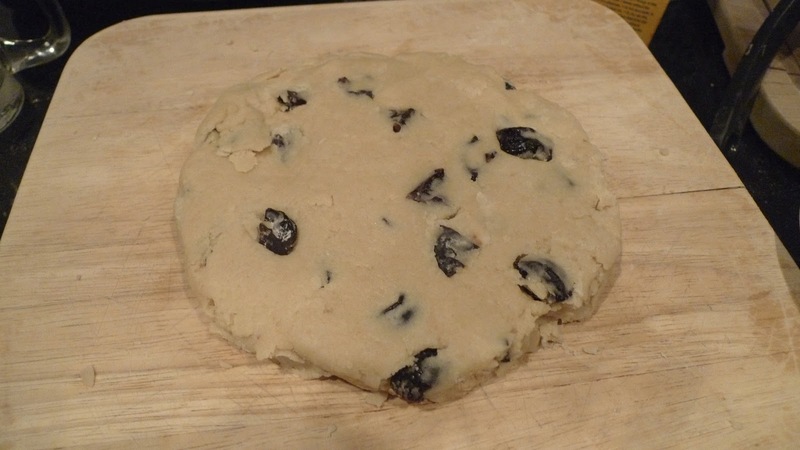 Roll until the dough is 1-inch thick. Cut scones out with a 3-inch round cutter. 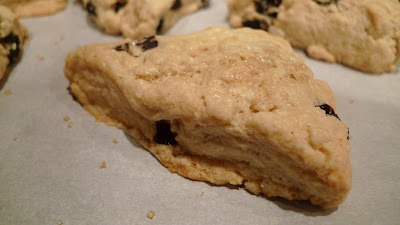 (You could cut scones with a different size cutter, but it will yield a different amount of scones than listed above. Alternatively, you can make a more traditional scone shape by keeping the dough in a circle as you roll it out, then scoring the top in 6 or so wedges. Bake whole, then slice into wedges.) I made two round disks and cut the disks into 8 pieces. Put scones on a foil-lined cookie sheet. Brush the remaining cream on the tops of the scones. Sprinkle the raw sugar on scones. Bake for 20 to 25 minutes. These mini scones were perfect for her shower. It had a hint of sweetness and warm notes of vanilla. The prunes added a nice intrigue as well. 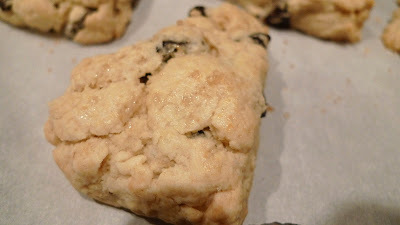 Scones look intimidating, but they are really easy to make and the clean up is so easy. It's the perfect "one bowl" recipe. Seriously you should try it, it tastes really good. I triple dare you!